Succulents are easy plants to grow and care for. These plants are native to areas prone to drought. As a result, they store water to last them through long periods with little or no water. This feature makes them ideal as in-home plants or as part of a garden in warmer climates. If you already have existing succulents, you can propagate them yourself. Propagation is typically done with a leaf cutting or an offshoot. Remove a leaf from the plant below the main flowering element. Make sure the leaf comes away clean and contains all parts of the leaf. Put leaf in dry area and allow to dry. This process generally takes a few days. When leaf becomes calloused, it is time to plant. When calloused, the leaf will appear splotchy, discolored, or brittle. Place well-draining or succulent soil in a drainable pot. Set leaf on top of soil. Water your succulent very little, about once a week. When roots appear, remove the parent leaf. Typically, this leaf will wither. Be careful not to damage the new roots in this process. Your plant will take root and you will have a new succulent. If your succulent develops an offshoot at the base of the plant, you can gently remove it to grow a separate plant. To do so, simply allow the offshoot to develop roots for a period of 2-3 weeks. Once you see roots, remove with snips or simply twist to remove. Then follow steps 2-7 above to propagate your new succulent. 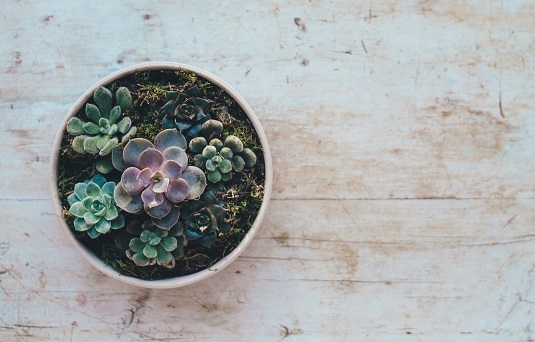 Plant your succulent in a pot that drains: Succulents do not like to live in wet soil. As plants accustomed to high temperatures and little moisture, they can actually rot, contract disease, or die if overwatered. Potting in a planter that has slots for drainage can help prevent overwatering. Use succulent soil or soil that drains well: Using the correct type of soil will help your plant thrive. Because succulents don’t appreciate overwatering, using soil that drains will keep your plants appropriately moist. Plenty of sunlight (at least half a day): These plants hail from hot, dry climates and love plenty of sunlight. Although they will go dormant in the winter and require less sunlight, most succulents like at least a half day to a full day of sunlight depending on what type of plant you have chosen. Water heavily, but not often: Overwatering is an issue with succulents. Watering every day and leaving the plant with soaking soil will kill your succulent. However, simply misting them will also leave them wanting more. Supply your plant with a large amount of water about once a week (also varies depending on the variety). Check the soil to see that it is drying between waterings. Maintain a warm temperature: Succulents like about 70-80 degrees in summer months and 50-60 in winter months. Succulents make great houseplants, but they can also add an exotic edge to your outdoor garden. When planting an outdoor garden, choose your succulents and accompanying plants carefully. Succulents prefer lots of sunshine, dry soil, and little watering. If this doesn’t fit the surrounding flora, consider using your succulents as houseplants or moving them to a separate location. Choose a sunny spot: Give your succulent lots of natural sunlight. Make sure you have appropriate soil: Does the soil drain well? If not, backfill the hole with sand or gravel to increase drainage capability. Many succulents will fall victim to rot if they are not set in the right kind of soil. If watering is necessary, pour water directly onto the base of the plant to keep the leaves dry. Water heavily until soil is moist. Let the soil dry before the next watering. Check out Succulents and Sunshine for more specific information on watering your plant. Bring your succulents indoors for the winter: Many of these exotic plants do not fare well in the winter. If you live in an area that has a cold winter, you an easily transplant into a container for indoor storage. 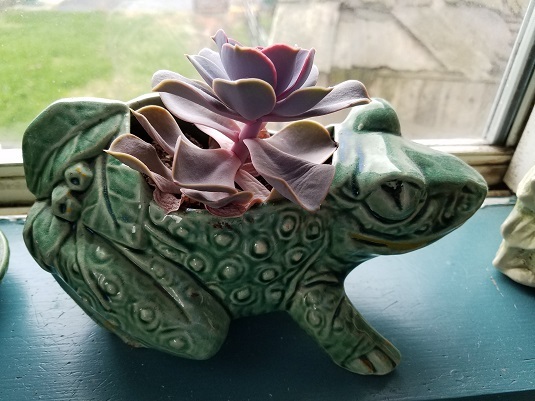 Regardless of what kind of succulent you choose, make sure you water it properly and it will be an interesting addition to your home or garden.